Pupdate: Four weeks old! Pupdate: 6 weeks! The puppies are getting very active and ready to begin the initial conditioning processes. One of the most important first exposures to a future hunting companion is new terrains and environments. Even though that by the time they leave my house, running the entire property will be easy and familiar, this is a video of their first visit to the “back hill”: http://www.youtube.com/watch?v=mbc_Hi5cYWw Giving them practice with new environments attempts to eliminate nervousness when exposed to different places such as their new homes and the variety experienced in a hunting season. 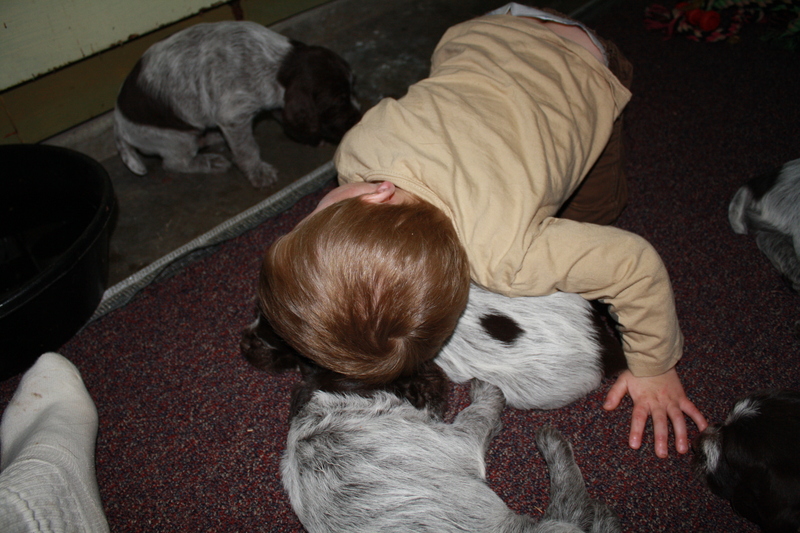 The puppies are also having daily socialization with myself and my children, both indoors and outdoors. 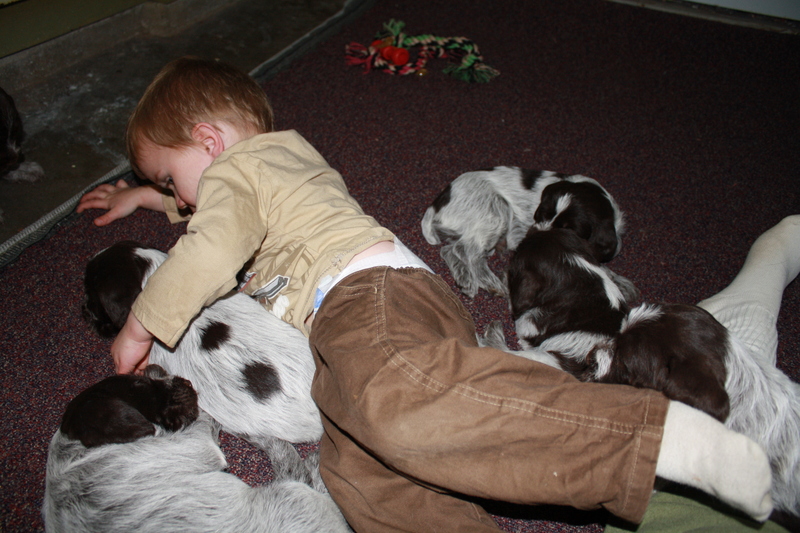 This important activity has been ongoing with my older children since birth, but now that the puppies are “tough” enough to deal with handling from even my youngest family member, we are working/playing with them more. 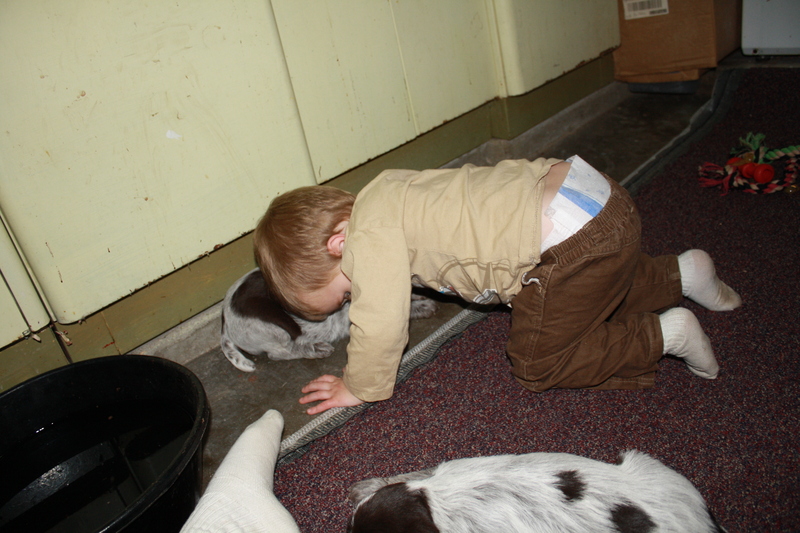 Here are some photos of the puppies “hanging out” on the floor of the utility room with my two-year old son Caleb and I. Bonding with humans is absolutely the most important part of starting with a puppy. 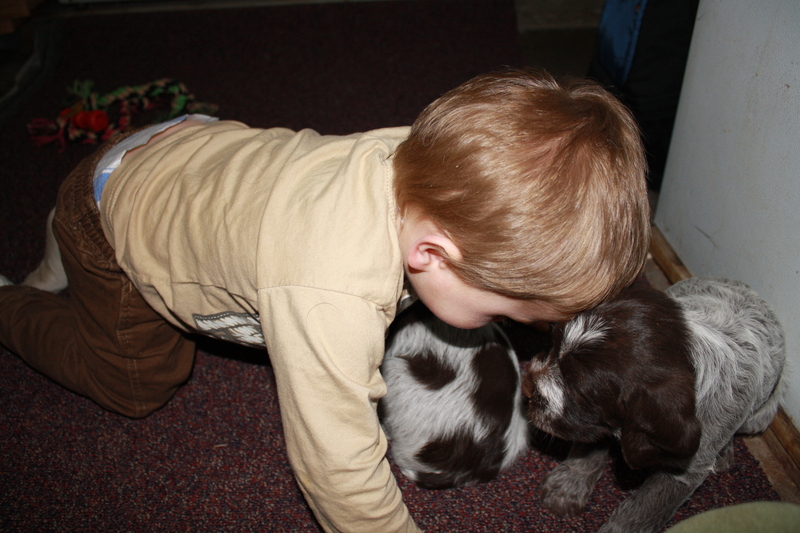 The human-dog bond is what begins the process of obedience. Without emotional bonds, dogs have no desire to please humans. 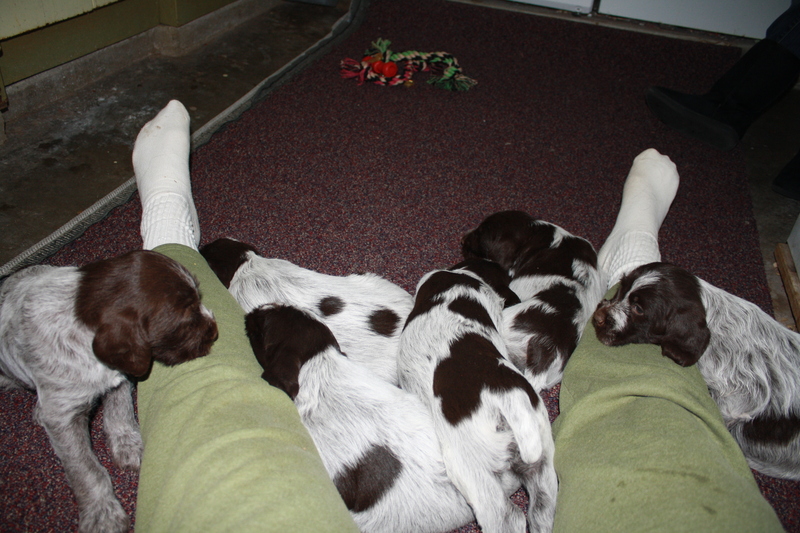 This week, the puppies will begin individual work with me, away from the litter and their mother. Being away from the litter and mother for the first time is stressful, but it is extremely important in beginning the process of separation from the litter and gaining the confidence to be independent from them. I’m looking forward to spending individual time with the puppies and get a better idea of their individual personalities. Thanks for all of the pics and videos. It is fun to watch them. We are so excited the time to get our pup is getting closer!! !